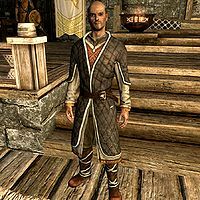 Proventus Avenicci is the Imperial steward to Jarl Balgruuf of Whiterun. He is also the father of Adrianne Avenicci, from whom he allegedly takes advice. He can be found in Dragonsreach and, when he is not with the Jarl, will usually be found sitting down at a table at the back part of the Great Porch, or eating in the large tables in the main part of Dragonsreach. He will sell you a house called Breezehome in the city for 5,000 gold. He will also sell upgrades to the house, but will only do so if he is inside Dragonsreach. The dialogue option to purchase housing upgrades will not be available if he is on the Great Porch or in the Dragonsreach Jarl's Quarters. Proventus will also sell you Tundra HomesteadCC for 7,500 gold at any time. If the Stormcloaks take over Whiterun, he will move to Solitude. There he can be found in the basement of the Blue Palace, but he will not sell any property or upgrades. These options are moved to Brill, the steward who replaces him. He can be found in the Great Porch area of Dragonsreach. Proventus wears a set of fine clothes along with a matching pair of boots. He wields an iron dagger and carries a belted tunic along with a selection of upper-class loot and gold. Upon talking to him, he can be found saying, "I serve Jarl Baalgruuf [sic] as steward. ", "The Jarl is, as you can imagine, very busy. Perhaps I can assist you? ", or "The task of Steward is more important than you realize. The Jarl often asks for my invaluable council." He may instead mention his daughter, Adrianne: "I'm kept so busy, I don't get to see my daughter as often as I'd like. Perhaps you've met her? Adrianne? She owns the shop, Warmaiden's." Proventus may comment on a dragon's capture atop Dragonsreach: "I'll be glad when that beast is gone from Dragonsreach. I never understood what the point of all this was." When he and Balgruuf are exiled to the Blue Palace, he may tell you, "Be warned, the Jarl is in a foul mood since the Stormcloaks overran Whiterun." If you end conversation with him while he is in Whiterun, he can be found saying, "Enjoy your visit to Dragonsreach." Otherwise, he will say, "If there's any more I can help you with, just let me know." When he is in Whiterun, he will gladly answer your questions regarding the city. When asked about its history, he will reply, "Ah, splendid! Our fine city has a proud history, and I'm happy to share what I know. The history of Whiterun begins with Jorrvaskr, the hall of the Companions. For a long time, it was the only building on the mountain. As time passed, a thriving community sprang up around Jorrvaskr, as was common with mead halls. Today, Whiterun is the jewel of Skyrim. I can say without boast that is the greatest city in all the holds." If you ask him, he will also tell you about Whiterun's districts: "Well, there are three of them. Arranged in three tiers, as you may have noticed. The Plains District is so named because it's the closest of the three to the plains that surround the city. The inn and marketplace are found there. Most of the city's residents live in the Wind District, which is the middle of the three. Dragonsreach occupies the highest, which we call the Cloud District. From here, the Jarl can see all that goes on within his city." Lastly, Proventus will explain why the keep is called Dragonsreach: "That is an old tale, but well known to those of us who serve in the keep. Long ago, there lived a mighty hero of the Nords. Olaf One-Eye. Olaf did battle with a fearsome dragon named Numinex. The struggle between Olaf and the dragon culminated in a mighty duel atop Mount Anthor, with Olaf the victor. Olaf returned in triumph to Whiterun. By his decree, the city's keep was rebuilt as a prison for Numinex. And so, from that time until this, our great keep has been called 'Dragonsreach.'" Should you meet Adrianne, she will request that you deliver a sword to Proventus. Give the sword to him and he will say, "From Adrianne? Ah, this must be that weapon for the Jarl. Poor girl, so eager to prove herself. I'll present it to Balgruuf when his mood is... agreeable." He will end by saying, "Thank you. Please, take these few coins, for services rendered." as he hands you twenty gold pieces. Adrianne may talk about her father: "Have you met my father? He's the steward, up at Dragonsreach." and "You think all the council my father provides the Jarl is his alone? Hmph. Let's just say I advise the advisor, and leave it at that." If Proventus is exiled, however, she will instead say, "Have you met my father? He was the steward, up at Dragonsreach when Balgruuf was Jarl." Her husband, Ulfberth, will also mention Proventus, if you ask about who forges his wares: "Adrianne. At her forge, just outside. Place is named after her. 'Warmaiden's.' It's a childhood nickname, given by her father. What I hear, she was playing with swords even back then." "If you'll excuse me, I'll return to my duties." Proventus: "My lord. Please. You have to listen. I only counsel caution. We cannot afford to act rashly in times like these. If the news from Helgen is true... well, there's no telling what it means." Balgruuf: "What would you have me do, then? Nothing?" Proventus: "My lord. Please. This is no time for rash action. I just think we need more information before we act. I just..."
Balgruuf: "What do you say now, Proventus? Shall we continue to trust in the strength of our walls? Against a dragon?" Irileth: "My lord, we should send troops to Riverwood at once. It's in the most immediate danger, if that dragon is lurking in the mountains..."
Proventus: "The Jarl of Falkreath will view that as a provocation! He'll assume we're preparing to join Ulfric's side and attack him." Balgruuf: "Enough! Irileth, send a detachment to Riverwood at once." Balgruuf: "I'll not stand idly by while a dragon burns my hold and slaughters my people!" Proventus: "If you'll excuse me, I'll return to my duties." Balgruuf: "That would be best." Hrongar: "Didn't you hear the thundering sound as you returned to Whiterun? That was the voice of the Greybeards, summoning you to High Hrothgar! This hasn't happened in ... centuries, at least. Not since Tiber Septim himself was summoned when he was still Talos of Atmora!" Proventus: "Hrongar, calm yourself. What does any of this Nord nonsense have to do with our friend here? Capable as he/she may be, I don't see any signs of him/her being this, what, 'Dragonborn.'" Hrongar: "Nord nonsense?! Why you puffed-up ignorant... these are our sacred traditions that go back to the founding of the First Empire!" Balgruuf: "Hrongar. Don't be so hard on Avenicci." Proventus: "I meant no disrespect, of course. It's just that... what do these Greybeards want with him/her?" Balgruuf: "That's the Greybeards' business, not ours." (to you) "Whatever happened when you killed that dragon, it revealed something in you, and the Greybeards heard it. If they think you're Dragonborn, who are we to argue? You'd better get up to High Hrothgar immediately. There's no refusing the summons of the Greybeards. It's a tremendous honor." If you have yet to meet the Greybeards, you may ask Proventus about them. He will reply, "Near as I can tell, a bunch of ancient Nord hermits who live on top of a mountain. Never heard of them talking to anybody before. If they really do want to talk to you, you'd better go find out what they want. You never know." If asked what's it mean to be Dragonborn, he will say, "The only thing I remember is the old story of Tiber Septim being called Dragonborn by the Nords, before they switched sides and joined the Empire. No doubt those Greybeards up at High Hrothgar will talk your ear off about it." He will also tell you what he knows about Shouts: "Old Nord folk tales always talk about Shouting their enemies to pieces. I always thought it was just a myth. If you think you might be able to do that kind of thing, the Legion could certainly use your help. Go talk to the Greybeards, see what they can tell you." Balgruuf: "Proventus, what do you make of all this? If Ulfric were to attack Whiterun..."
Proventus: "As in all things, Lord, caution... I urge us to wait and see." Balgruuf: "I'm of a mind with Irileth. It's time to act." Proventus: "You plan to march on Windhelm?" Balgruuf: "I'm not a fool, Proventus. I mean it's time to challenge Ulfric to face me as a man, or march his Stormcloaks up to the gates." Proventus: "He'll do no such thing! A dagger in the back is all you could expect!" Irileth: "He was rather straight forward with Torygg." Proventus: "Torygg? He simply walked up to the boy and murdered him!" Irileth: "That 'boy' was High King of Skyrim." Balgruuf: "I'm not the High King, but neither am I a boy. If Ulfric wants to challenge my rule in the old way, let him. Though I suspect he'll prefer to send his 'Stormcloaks' to do it for him." Irileth: "True. He's already proven his personal strength. Now he seeks to prove his army's." Proventus: "Then might I urge you to consider General Tullius's request? I mean, if you are bent on offending Jarl Ulfric..."
Irileth: "Ulfric is the one who has offended. But, Proventus has a point. Ulfric has made it clear. In his mind, to refuse his claim is to side with the Empire." Proventus: "And what harm is there in letting a few legionnaires die in place of your own men?" Irileth: "Was it cowardly then to accept the White-Gold Concordat?" Balgruuf: "This again?! That was different. Was I given a chance to object to the terms of the treaty? No. The Jarls weren't asked. We were told. And we had to like it." Proventus: "The chests of gold didn't hurt." Balgruuf: "Damnit! This isn't about gold!" Irileth: "It's time to decide." Proventus: "Lord, wait. Let us see if Ulfric is serious." Balgruuf: "Oh, he's serious. But so am I." 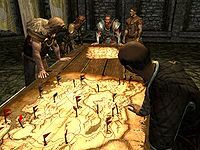 Alternatively, if you have joined the Stormcloaks, Ulfric will tell you to deliver his axe to Balgruuf, who will discuss this with Proventus and Irileth as outlined above. Balgruuf: "Proventus. Bring me my pen. And the good parchment." Proventus: "Are we writing a letter, Lord?" Balgruuf: "Yes, to General Tullius. I need to make a few things clear before I accept these Legionnaires of his." Proventus may attend Elenwen's party at the Thalmor Embassy. Though he seems to enjoy the gathering, he is nervous from being around so many important people. You can ask him if he's enjoying the party, and he will reply, "Oh, hello there. I didn't expect to see you here. Yes, I am indeed. Elenwen always serves the best wine at her parties. The food is excellent as well. Though I confess, being surrounded by so many wealthy and important people makes me feel more than a little nervous." He will agree that it's quite a gathering: "Oh, yes! Quite! So many important people from all across Skyrim." If asked what he does for a living, he will answer, "I'm the Steward of Whiterun. I serve Jarl Balgruuf in Dragonsreach. Truth be told, I'd be more comfortable if I were back there. I get nervous in the company of so many worthies." Upon saying goodbye to him, he will say, "Don't let me keep you." With the Tundra Homestead Creation installed, you will be directed to Proventus when you read the Homestead For Sale notice in order to purchase Tundra Homestead, but only if he is currently the steward of Whiterun. You will then be able to purchase "a homestead outside of the city" from him for 7,500 gold. Once you purchase the property, he will hand you the key and say, "Wonderful! Here is the key to your new home." Proventus: "My lord, our provisions are running dangerously low. Our stores of meat, wine and grain are all but depleted." Balgruuf: "Purchase more supplies, then. That's your job as Steward, isn't it? Why do you trouble me with these details?" Proventus: "My lord, since Ulfric Stormcloak's uprising, the cost of goods has doubled. I'll need more coin if I'm to provision us properly." Balgruuf: "Our coffers are nearly empty. I can scarcely afford to pay the guards, and we need every one of them in these troubled times. You'll have to make do with what we have, Proventus." Hrongar: "Proventus, you must help me. We need to convince my brother to do more for the war effort." Proventus: "What would you have me do, Hrongar? Your brother is the Jarl. You know I can't question his judgement." Hrongar: "I'm not asking you to defy the Jarl, just to open his eyes. Use subtlety and suggestion to turn his thoughts to the war. You're his steward, he'll listen to you." Proventus: "Leave me out of your intrigues, Hrongar. If you have something to say to the Jarl, say it with your own tongue." Irileth: "I am concerned about the Jarl's safety. Too many of our guards have been redeployed to fight the Stormcloaks." Proventus: "What would you have me do? If we do not send men to fight in the war, you'll find yourself guarding one of Ulfric's men." Irileth: "And if an assassin slips past the night watch, we won't have a Jarl at all. Without Balgruuf's leadership, Whiterun will descend into chaos." Proventus: "Nonsense. If Balgruuf falls, someone will take his place, for better or worse. In the meantime, we have a war to win. And win we must." Proventus "Sir, we really must talk." "Balgruuf, my Jarl. A word, if I may." "I need but a moment of your time, my lord." "You've got sixty seconds. Go." Proventus "Well... It's your son. Nelkir. The boy has been acting increasingly peculiar. Moreso than normal, I mean. Something really should be done..."
"We really must discuss the security here in Dragonsreach. Perhaps we could limit patrols in the city, and retain more guards here?" "There's been talk again in the streets. A general fear that the giants may move south, and then... Well, you understand." "One of the servants had a wonderful idea. Fireproofing Dragonsreach. In case of attack by, um... air." "My daughter Adrianne wants to forge a new sword for you. Now, it wouldn't be a Skyforge blade, I know, but she really is quite gifted..."
"I think the time might be right for another public appearance. Maybe address the patrons at the Bannered Mare? Or visit Jorrvaskr?" Balgruuf "Damn it, Proventus. I've got war lurking just outside my gates, and this is what you offer me? This? Begone." "Yes, yes. Take care of it, Proventus. Whatever it is you're talking about..."
"Proventus, you're my steward. Your job is to offer me counsel. This? This is not counsel." "Hmm... All right, yes, I see your point. Make the necessary arrangements." "As you say, my Jarl." 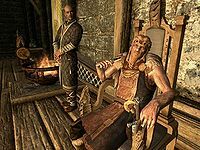 Proventus: "My lord Jarl, if we do not take steps soon, our coffers will be empty." Hrongar: "Raise the taxes, then! Put anyone that refuses to pay in the stocks and make an example of them." Proventus: "As you command, my lord. But, the issue could be solved another way. If we spend less on new arms and armor for the guards, for example..."
Hrongar: "We're at war, old fool, or have you forgotten? Whiterun is the crown jewel of Skyrim, and you would leave us defenseless?" Proventus: "Forgive me, my lord. It was foolish of me to make such a suggestion." Proventus will equip Balgruuf's Greatsword after you deliver it. This page was last modified on 23 October 2018, at 10:20.